A column, particularly of structural steel; an upright bar placed between the mullions to strengthen a leaded light. 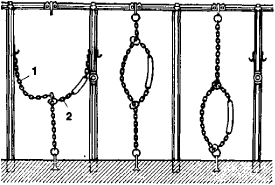 a device for tying animals at such places in buildings as stalls and milking stalls, and sometimes in pastures and pens. A stanchion prevents the animal from moving too far forward or backward, from putting its feet in the feed trough or manure gutter, and from lying down across its stall. Stanchions are designed for one or several animals and are either vertical or horizontal in construction. The most common type of individual stanchion is the vertical two-ended chain stanchion (see Figure 1), which consists of two sections of chain 155 and 50 cm long with rings on the ends. 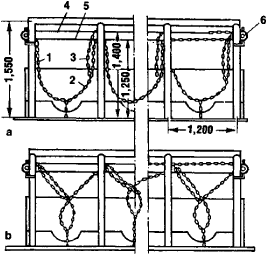 The long chain is secured to the floor or front wall of the feed trough and suspended vertically from a hook on the stall frame. The short chain is mounted on the long one and put around the animal’s neck. Another type of individual stanchion is the individual cable stanchion. Figure 2. 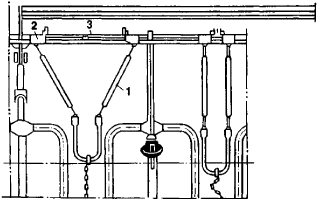 Group chain stanchion: (a) open, (b) closed; (1) long chain, (2) short chain, (3) double chain, (4) and (5) cables, (6) drive cylinder. Measurements are in millimeters. collars open up, permitting the animals to leave the stall at will. Turning the handle of the drive mechanism in the opposite direction brings the arms of the collar closer together, tying the animals in the stall. A structural steel member, usually larger than a strut, whose main function is to withstand axial compressive stresses. An upright metal post on a ship. 1. A prop, upright bar, or piece of timber giving support to a roof, a window, or the like. 2. An upright bar, beam, or post, as of a window, screen, railing, etc.